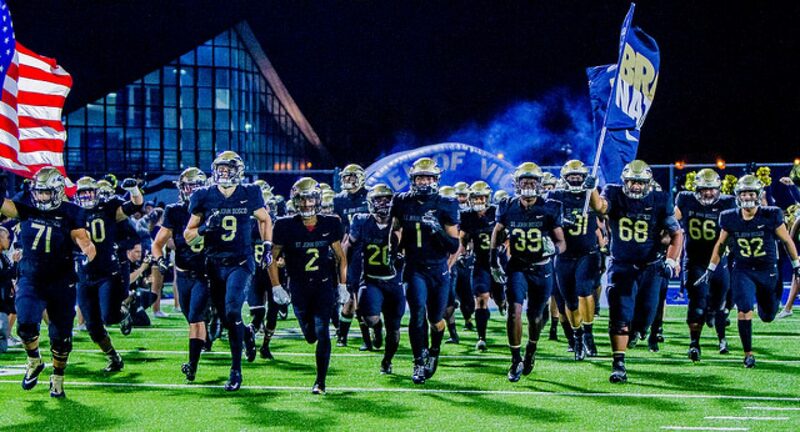 The St. John Bosco Braves opened up their promising postseason on Friday with a dominant win over the Serra Cavaliers, winning 49-0 in easy fashion at Panish Family Stadium. The national and state championship quest is on for the number one nationally ranked Braves, who asserted their dominance with a controlling victory in their first round affair against Serra. The same formula for success was used in this one for the Braves: start quick and let the defense control the tempo and pace of the game. Five-star quarterback DJ Uiagalelei went 14-19 for 255 yards and five total touchdowns, so basically just another day at the office for him. Uiagalelei hit senior receiver Colby Bowman wide open on a 20-yard strike for the first score of the game, and then hit senior running back George Holani for a 22-yard touchdown a few drives later, pushing the Braves early lead to 14-0. Holani had another excellent all-purpose game, rushing 11 times for 88 yards and a touchdown, as well as catching two passes for 42 yards and a score. Uiagalelei would later in the first half hit standout junior receiver Kris Hutson for a 5-yard touchdown, and the Braves went into halftime with a comfortable 21-0 advantage. In the third quarter, the Braves would just absolutely put this game and Serra’s season to rest. Uiagalelei hit receiver Jake Bailey for a 55-yard touchdown, continuing to spread the ball around efficiently. Then, the Braves already fired up and dominant defense would score some points of their own, with senior defensive end and 2017 Trinity League sack leader Cole Aubrey falling on a loose ball in the end zone after a hit on Serra quarterback Doug Brumfield. Holani would run for a 31-yard score through a wide open hole and Uiagalelei took a read-option nine yards to the house, giving the Braves a 49-0 lead before the end of the third quarter. 49-0 would be the final score, with the Braves easily coasting to a first round victory as many anticipated. The Braves will take on San Clemente High School in the next round, who is coming off a first round victory over Murrieta Valley High School and looks like an extremely fired up football team right now. No game will be easy in the southern section division one playoffs, and we’ll have the preview of this one later on in the week on The Brave News.